French patisserie, especially entremets always hold a fascination for me. They are so delicate, so elegant, so perfect. When you run your dessert fork through it, you can see those different layers, each with a unique taste and texture. They take some time to make, but it's well worth it. In the end even the serving temperature can affect the tasting experience. 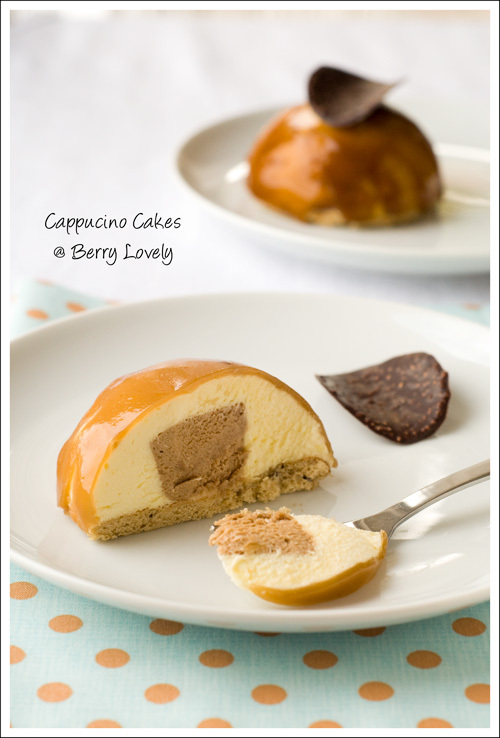 So I have decided to try making these beauties more often, starting with some cappuccino mousse cakes. 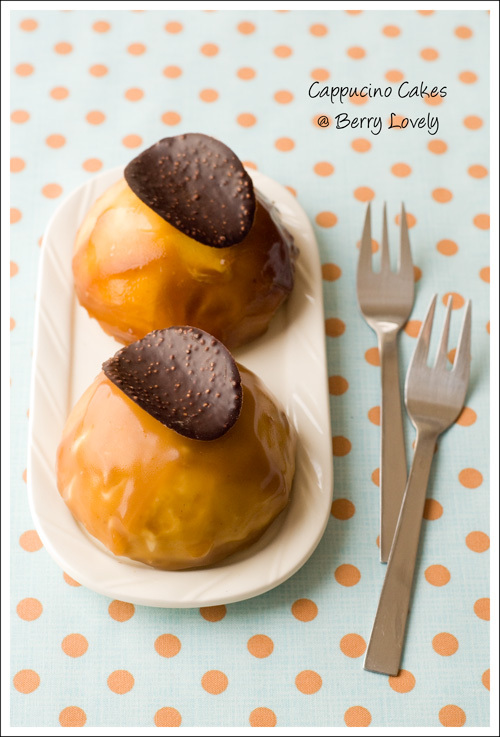 The cakes consist of four parts: a coffee flavored sponge, a mascarpone mousse, cappuccino core, and a coffee glaze. It flavors are similar to tiramisu. I had some problems with putting the glaze on the cakes. It was either too thick, or too hot, that the cakes started to melt right away. I didn't really like how they looked. Well, they still tasted great, and so I hope to be able to make them look better next time. If you have any tips how to perfectly apply a thin glaze, I would be very happy to hear them. Preheat the oven to 200° C (400° F), and line a baking sheet with parchment paper. Whisk the egg yolks with about 1/3 of the sugar, until foamy. Beat the egg whites until soft peaks form, add the remaining sugar and continue beating until you reach stiff peaks. Carefully fold into the egg yolk mixture. Mix together the flour, corn starch and espresso powder and sieve over the egg mixture. Also add the chopped chocolate and carefully fold everything together. Don't overmix. Spread the batter on the prepared baking sheet and smoothen the top with a spatula. Bake for about 8 minutes until golden brown. Let cool on a wire rack. When cooled cut out round shapes in the size of your molds. Soak the gelatin in cold water. In a bowl over a water bath whisk together the egg yolk, sugar, milk and espresso. Stir until the mixture thickens. Take the bowl off the heat. Add the gelatin and stir until it dissolves. Add the chocolate, and let melt. Whip the cream until soft peaks form, and carefully fold into the cooled mixture. Fill in small silicon molds (mini muffin pan or ice-tray). Put the mold into the freezer and freeze overnight. Soak the gelatin in cold water. In a bowl over a water bath whisk together the egg yolk, half of the sugar, and the Amaretto. Whisk until the mixture thickens and is foamy. Take the bowl off the heat. Add the gelatin and stir until it dissolves. With a mixer whisk the mascarpone and sugar together until creamy. Slowly add the egg mixture to the mascarpone and use a whisk to combine. Whip the cream until soft peaks form, and carefully fold into the mixture. Fill the mousse into half sphere molds. Press one frozen cappuccino mousse insert into each mold and top with a sponge cake round. Freeze for at least 5 hours or overnight. Mix the glaze and the sugar and heat up with the coffee until thickened. Let cool slightly, then pour over the frozen cakes placed on a wire rack. If glaze gets to thick, warm it up again. Let glaze set and serve as soon the cakes have thawed.